Majority of those who have tried wearing the Adidas X 17.1 Firm Ground agree that it is very comfortable right out of the box. Most purchasers appreciated the shoe’s stylish design and aesthetics with one person saying that the X 17.1 looks better in person. This football boot offers a great fit, as reviewed by several individuals. Many footballers felt that the Adidas X 17.1 is light on the feet and it has helped them run faster on the field. A few reviewers mentioned that the shoe is worth its price. Some players lauded the shoe’s sock-like feel. A good number of reviewers liked this football boot’s stud configuration. The Adidas X 17.1 is an excellent boot performance-wise, said a couple of users. Many users complained that the sizing of the Adidas X 17.1 is a bit off. Most purchasers were disappointed because the lace holders easily rip out of the shoe. One fan reported that the Adidas X 17.1 caused a couple of blisters in the heel. A few of players commented that the sole fell off after a few games. The Adidas X 17.1 does not have any feature that makes it stand out from the rest, said a couple of expert reviewers. The Adidas X 17.1 is a top-tier football boot that does not fail in the comfort, fit, and looks departments. But while it has received plenty of good feedback, it has also garnered quite a number of negative comments from its users. Several complaints involve the lace loops ripping and the soleplate separating from the shoe. Despite the divided opinion from its users, the Adidas X 17.1 still delivers what it promised in overall performance, especially when it comes to traction and speed. 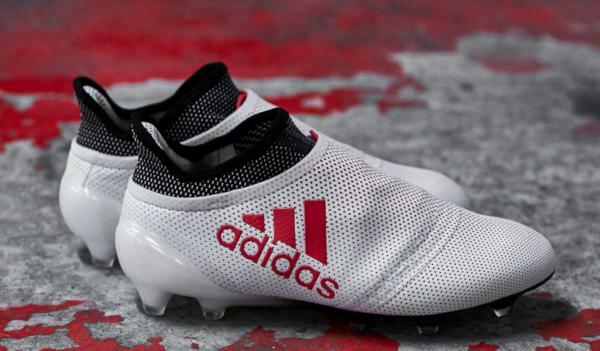 Adidas introduced the X 17.1 Firm Ground; a cold-blooded pack made for players through which ‘’cold blood’’ flows. The ones who are discrete and lethal. It suits the best to fearless players who played as predators on the pitch. These boots are made to fully unlock your potential. They provide everything for you to unleash your speed. Adidas finally released the facelift version of previous X16.1, A model which did not impress me at all. Redesign of a tech-fit collar, slimmer body in the heel area, were the first things that made me buy this model. Unfortunately, things were still not good enough for me, and they became the fastest pair of shoes that I get rid off. The tech-fit collar is made out of one piece which is very welcoming and nice looking compared to the previous model. That fat heel area, made out of "unused X15.1 collars", made me not look at them at all. It completely hugs your feet and gives you super lock down feeling from the very first try. This feature offers incredible comfort, and it shortens the time required for break-in. I don’t have any complaints about it. Putting your shoe on/off is not hard at all - everything goes smoothly and softly. It is stretchable enough and durability is not a question. The upper of X17.1 is coated with a thin layer of Adidas unique NGS technology. NGS stands for Non-Stop Grip and is presented by small 3D dots that give you extra grip and full control of the ball in all kinds of weather. I support this feature. I tested it, and I can say that It gives you all the necessary grip in hard conditions. Also, a thin layer feels completely opposite of what you expected. You might imagine that every new model in this caliber is a better version of F50, but it is NOT. Even though some users complain about the thickness of the boots, I personally don’t have any negative thoughts. Wearing them feels good, I did not have any problems with blisters or any area that would make discomfort. Feeling for the ball is also more than good. From passing to shooting, I did not have anything to complain about when it comes to material. The only question is, do you want your shoes to be super light or have some extra grams for additional features? The famous SprintFrame from Adidas took its presence also on this model. I think that this model has a really nice design. It is not too classic and simple which is the case with older models, but in general, it is pretty much the same thing. The main difference is in studs themselves. Studs are teardrop shaped, with a mixture of circular studs which provides good ability to change direction quickly. I feel good wearing them on the soft-ground pitch but I prefer Nike latest soleplate with Anti-clog option. Adidas heel construction, on the other hand, ensures maximum stability, allowing you to do the sharpest moves. Also, there is one feature called Midcut, that supports Achilles tendons, giving you superior stability and freedom to play without limits. Overall, the soleplate is light, flexible and it ensures a good grip. The only downside I experience was during on rainy weather when the soleplate is just magnet for mud. You can expect to gain one extra kilogram. We came to the section which disappoints me the most. Maybe this is the only thing that made me re-sell this model very quickly after buying it. Even though this boot looks great, from design to ergonomy, it is not true to size for me. I went with size 9 ½ UK / 44 FR(EU) and had fit problems just after warming up exercises. When I first tried them on, the fit was great. I said wow, I really feel comfortable in them but after I start using them, I didn’t like them. While running, I felt like I wear one whole size bigger shoes. I had small legs collision and there are a few times I had the opportunity to shoot but it ended up terribly. I went for goalkeeper chip which end up terribly as well. That was the last time I wore them. Overall look can be rated very highly. You can clearly see that a lot of hard work and creativity has been invested in this model. I like the colorway option. I felt very satisfied wearing these white weapons with red dots on them. It is a bit tricky to keep them clean always but those who are not willing to clean them after every training has plenty of other color options as well. Also, the details are well done on these shoes. Something that I really like on this model is soleplate mosaic reflection thing (that is how I see it). I love it, and this is another proof, how small details can play a significant role in the industry. Overall, the quality of these shoes should not be questionable. It is high-end manufactured, supported by many hours of hard work of engineering. It follows the trend and every year it brings something new that should help you improve your performance. Adidas did it again with this model, and I think they did a great job. In my case, the best size would be 0.5 – one size smaller. Even though it’s the same size as Ace 17.1 that I have been using, fit and lock down are completely different. My recommendation would be to try it on your feet before buying. Don't buy these with the expectation that they're gonna feel super super thin on your foot. On feet, the shoe is very comfortable out of the box. You can feel the seam on the side especially when making contact with the ball, but its not uncomfortable to the point of blistering. The overall upper feels soft and will soften up as your wear them in. It has a snug fit but not overly tight. It’s not my favorite, I feel that the Purespeed is a better shoe in the X line. On feet, the fit and comfort is really good. The upper will soften up as you wear them in. Following the “do not fix what is not broken” approach, the Adidas X 17.1 has similar tech specs as its predecessor, the Adidas X 16.1. Because of its one-piece construction, the touch on the ball and thickness across the entire upper is consistent. The Adidas X 17.1 Firm Ground features a TechFit compression upper that molds to the shape of the foot, giving it a second-skin fit. The heightened TechFit collar and the curved design at the back also offer flexible ankle support. Furthermore, this soccer cleat uses the Non-Stop Grip (NSG) technology that enhances the grip on the ball. The Adidas X 17.1 Firm Ground has the lightweight SprintFrame outsole as well. This TPU plastic material is flexible and moves nicely with the foot. The Adidas X 17.1 Firm Ground is available in standard size and it fits true to size. The sizes are 6.5 to 13 for men’s version and sizes 5 to 10 for women’s version. This football cleat uses the SprintFrame technology for the outsole. The forefoot area of this lightweight synthetic material is flexible enough to adapt to the movements of the foot. It also has ribs through the midfoot area to give it a bit of rigidity. The stud pattern of the Adidas X 17.1 FG is the same as its predecessors in the X 16 series. It has six studs in the forefoot, one support stud in the middle, and four under the heel. It is a combination of hybrid conical-bladed studs and raindrop-shaped studs. The stud pattern is intended to increase traction and speed on dry, natural grass. The Adidas X 17.1 FG uses the TechFit construction upper. This synthetic material follows the shape of the foot for a secure fit and excellent control of the ball. The Non-Stop Grip on the upper gives it a thin checkerboard texture to keep the ball from slipping even in wet conditions. The exposed lace of this football boot runs through five pairs of nylon loops that do not attach to the base of the shoe. The lacing system keeps the foot locked in place and prevents the middle part of the upper from stretching during changes of directions. The Adidas X 17.1 FG also has a heightened TechFit collar. This stretchable sock system ensures that the ankle is stable and secured in place. The curved design at the back of this football shoe alleviates tension from the Achilles tendon. The external heel counter that is connected to the outsole keeps the heel area intact. Internally, this football boot has a soft, synthetic suede padding for added comfort. Perhaps the charm of Adidas’ Lone Hunter pack comes from the fact that its color selection is quite an unusual one for football boots. Taking a closer look at the Adidas X 17.1 model, it sports animal prints using a bright orange, talc, and trace olive colorway. The soleplate is not exempt from this as the pattern runs from the upper to the soleplate. Judging from the pack’s name and its design elements, one can easily surmise what inspired this model’s design. Like lightning strike, the Adidas X 17+ football boot hits you in the face with its glaring colorway. Using a primarily yellow Techfit upper, this cleat demands attention as it is sure to stand out on the pitch. The mid cut collar, as well as the smaller details on the shoe, are presented as dark blue almost black color. A polka dot design is also apparent all over the shoe. Famous football athletes who wore the Adidas X 17.1 Firm Ground were Gareth Bale and Luis Suarez. This soccer cleat also has a kids’ version in sizes 10k to 12k. The men’s version of the Adidas X 17.1 FG is available in six captivating colorways. This soccer shoe was released on June 1, 2017. The 2018 FG versions of this model are the Adidas X 18+ Firm Ground and the Adidas X 18.1 Firm Ground.